Dan Girardi is okay after getting hit in the jaw with a deflected puck. He practiced Friday afternoon and will play in Game 2. Photo courtesy of MSG Photos. After the first playoff game last night, Alain Vigneault had his troops hard at work today during practice ahead of Game 2 at Madison Square Garden on Saturday night. Rangers’ fans got a bit of a scare last night when Dan Girardi fell to the ice after getting hit in the jaw with a deflected puck. Girardi left the ice with 9:23 left in the game, and did not return. However, Dan Girardi was back on the ice today at practice, and did not have many marks as a result of the stray puck. Girardi said that he was not cut on the inside or outside of his mouth, did not have any fractures, with just “a little swelling.” Girardi did not have any further protection, sporting just the helmet and visor. The alternate captain appeared in all 82 games this season, the fifth time he has done so in his career. Girardi would have played all 82 games last year as well if Vigneault did not rest him in the season finale. The only other Ranger in team history that has played as many complete 82 game seasons is Brian Leetch. Dan Girardi has battled through a lot of nagging injuries throughout his career. A puck to the jaw won’t hold him back. Photo courtesy of MSG Photos. That’s been the mentality of Girardi throughout his career, shaking off many minor injuries that would have kept other people out of the lineup. Nothing seems to bother him, and he plays through lots of nagging injuries. 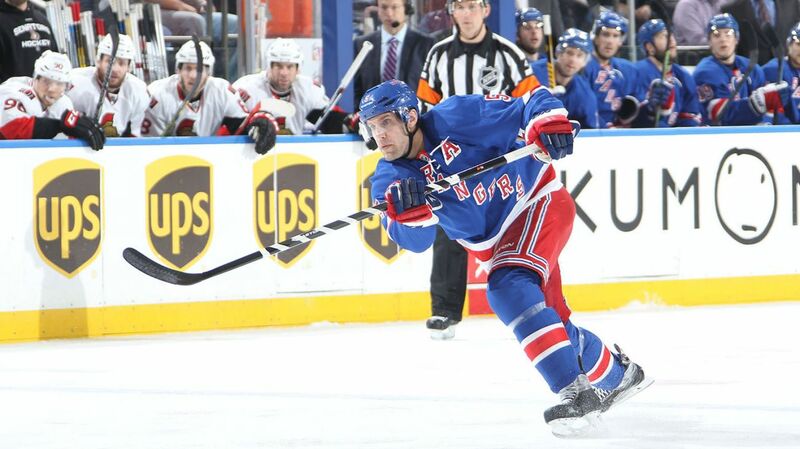 “He certainly puts his body on the line every shift he’s on the ice,” head coach Alain Vigneault said about Girardi. Henrik Lundqvist also commented on his defenseman. “He’s a tough guy, plays through a lot of pain; but he’s back today and that’s a good thing. With some good news comes some not so good news. 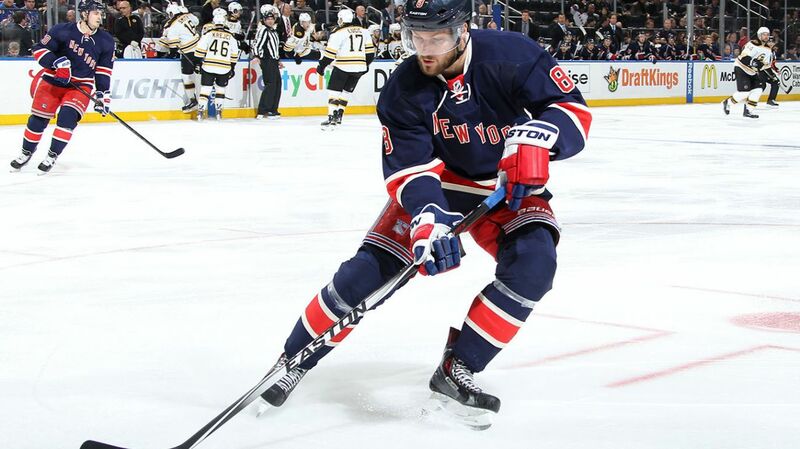 Kevin Klein was initially expected to be back for the playoffs, but he has not been cleared for practice, despite the fact that it has been five weeks since the injury. 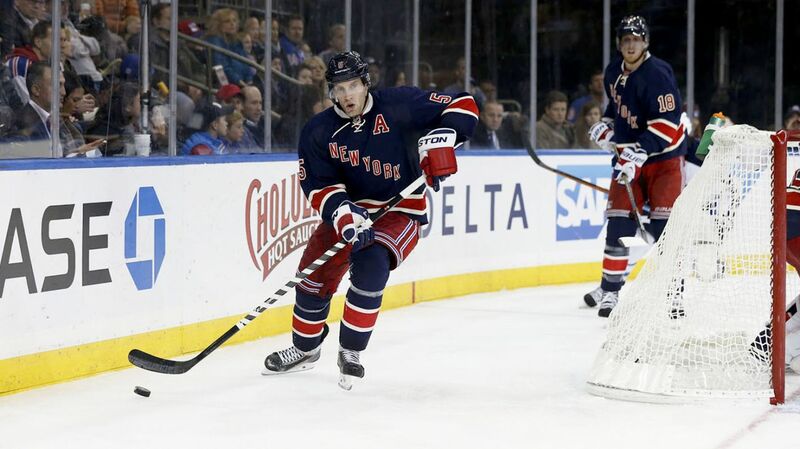 Kevin Klein has missed five weeks with a broken arm, and his return date is still unknown. Klein has been skating by himself, but has not been cleared for practice. Photo courtesy of MSG Photos. Klein has been skating on his own, and has not done a lot of stickwork. It’s getting a bit concerning, and it’s fair to wonder if there is something else going on, or if it is a more serious injury than it initially appeared to be. Alain Vigneault said that Klein would not play in a game without getting one full practice in, so that essentially rules out his return for tomorrow night’s game. As for the lineup, don’t expect any changes. Rookies Kevin Hayes and JT Miller appeared a bit jumpy at times, but played well in the win. Miller was very noticeable, throwing the body often and creating a few grade A scoring chances for himself. Posted on April 18, 2015, in Rangers Updates and tagged Alain Vigneault, Cam Talbot, Carl Hagelin, Chris Kreider, Dan Boyle, Dan Girardi, Derek Stepan, Derick Brassard, Dominic Moore, Henrik Lundqvist, James Sheppard, Jesper Fast, JT Miller, Keith Yandle, Kevin Hayes, Kevin Klein, King Henrik, Madison Square Garden, Marc Staal, Marc-Andre Fleury, Martin St. Louis, Mats Zuccarello, Matt Hunwick, MSG, MSL, New York Rangers, NHL, NHL 2014-2015 Season, NHL Playoffs, NY Rangers, NYR, Rangers, Rangers Nation, Rangerstown, Rick Nash, Ryan McDonagh, Stanley Cup Playoffs, Tanner Glass, The Ranger Zone. Bookmark the permalink. Leave a comment.